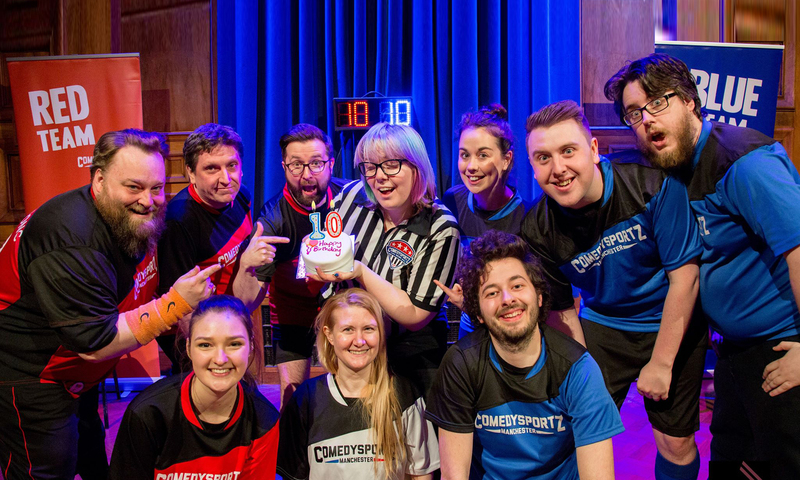 ComedySportz is the North West’s top improvised comedy show! Two teams compete for your laughs with quick witted sketches, scenes and songs inspired by your suggestions to create a show that’s fast, feelgood and always unpredictable. There’s a referee on hand to ensure a good clean game with penalties for bad behaviour and bad jokes. Who wins? You decide! We’ve been entertaining audiences across the UK (and abroad) since 2001 and are firm favourites at the Edinburgh Fringe Festival. Part of the CSz Worldwide family we are often joined from ComedySportz players from around the world! With plenty of opportunities to get involved in the action, it’s fantastic fun for audiences of all ages from chuckling children to giggling grandparents. Catch us in venues across the UK (but mostly Manchester)! If you loved classic shows like ‘Whose Line Is It Anyway?‘ you’ll love ComedySportz! Interested in booking our shows for your theatre? Get in touch today.